You try to commiserate with your friends and family, but they seem to shun you lately. Your friends don't know what you are talking about when you complain about your unhealthy relationship. They think that your partner is a perfect angel. Your family is confused about your erratic behaviors. Everyone thinks that you have gone stark-raving mad. You try to get your wits about you, but your partner is always there to tell you that you are worthless, clingy, emotional, needy, and crazy. Maybe his parents and his other family members are supportive of him. They don't seem to like you. His charm has won over everyone else. You wonder if you are the one who is the problem. After all, why can't everyone else see that your partner is causing the decline in your mental health? Why don't they empathize with your emotional pain? You don't feel like yourself anymore. You feel like a shell of your former self. You were so much vibrant and life-loving before you met the narcissist in your life. You love him, but you recognize that he is tearing you down at the same time. You wonder why your relationship isn't supportive, loving and filled with personal growth. The problem is this: you can't tell which one of you is crazy. At first, you were certain it was him. But lately, you wonder if your own sense of sanity is declining. You feel emotional, exhausted, depressed, frazzled, stressed, and confused. You think that you might even suffer a nervous breakdown any second now. Not even the counselors believe the suffering that you are experiencing. Most people have no idea what you are going through. Does he talk you in circles when you confront him about his whereabouts when he is running late? Does he tell you that you are being 'too clingy', 'too emotional', and 'too needy' when you say that you want to spend time together? Does he get defensive when you want to move the relationship forward in any way? Does he balk at anything resembling maturity and commitment? Does he isolate you from friends and family so that he has the opportunity to win everyone over to his side? Does he stop you from having any independence because he is afraid that you will leave him if you had some moral support? Is his self-esteem wavering to the point where he thinks that you might get smart if you talk to others? Does he fear you 'figuring out' what he is up to, especially if other people validate it to you? Must read to gain easy to understand insights that blow your mind on how your family or someone you know acts the way they do. Gets right to the nitty gritty. I thought this would be a fluffy intro to narcissism/gaslighting, but took a chance , and am not sorry! Author gets right to the point(s). I recommend this to anyone who ha a concern about narcissism or gaslighting. It covers a lot of descriptors, and perhaps the person you know does not exactly fit all the criteria, the author illuminates a lot of the drama and problems surrounding relationships with narcissists, and the people who interact with them. Not all narcissists are intentional in their behavior, and the text is sensitive the the dilemma of narcissism and gaslighting being a form of mental illness, as well as the trauma caused to those who love them. My husband doesn't exactly fit the description of narcissist, but I learned how to help myself, and to identify triggers he uses that are damaging. Yes ... it's not all in your HEAD! That difficult individual may very well be on the spectrum of total self-absorption and narcissism. If in doubt, purchase this book! This audiobook is a compendium of facts about narcissists. It is not a book about the techniques of Gaslighting which is only mentioned in relation to narcissism and not developed. The book has no depth or analysis - just a laundry list of facts about narcissism of which Gaslighting is just one. A half hour of pure clarity. Extremely helpful! This audiobook nailed my situation! It brought clarity and validation to everything I've experienced in the past 3 years. It's short and to-the-point nature will be valuable in helping me explain what happened when talking to the people who care about me. I'll simply have them listen to the book....most people are willing to give a half hour to understand. Do this for yourself!! I can relate to almost every word, and now I know why. And now, I don't feel at fault or guilty for the way things unravelled. It would have happened anyway, with anyone. More fragmented info, write a whole book already!! She has great info, but distributes it like M&M's. None of her work is worth the madness of her short incomplete stories. This book may have very well saved my life (or the life of my narcissistic spouse)! I've been miserable for my entire seventeen year marriage. I've known that I was being emotionally and sometimes even physically abused, yet I continued to stay, hoping for the relationship I dream of. I've felt like.ive slowly beennh9ing insane and that my brain and memory are cometely shot. My husband always talks me in circles and gets so over-the-top angry, especially when I make even the ightest complaint about his actions. I constantly fear for my sanity and sometimes even my life! I came across this audio book by accident and decided to read the books' information. As I read, I began to break down in a way I have been unable to (I've been too numb for tears for years) and felt that the author was telling MY story. Could it be that someone else actually understood what I was going through? Could it possibly be that I WASN'T alone? What my husband is has a name! I couldn't believe what I was reading and purchased the book and several others on NPD and found my life with my husband, written in those pages. I feel a sense of freedom that I can't remember ever feeling. I feel elated, scared, overwhelmed and even joyful and giddy. I'm also VERY angry. Angry at my friends, especially my two best friends of 13 years, whom have both decided that my husband is wonderful and that I'm overreacting. I'm going no contact. I'm even moving from Texas to Tennessee, as soon as I'm able. Now that I understand that he'll never change and probably only continue to get worse, I can heal myself, instead of constantly trying to pick up the pieces of a broken relationship that never truly existed. Thank you more than I can ever even begin to express to the author. I wish that I could, in some way, return the favour. A repetitive rant about narcissist. Half the book sounds like a repetitive rant about narcissist. It's clear the person who wrote this was a victim of a narcissist and has a one sided view of them. Absolutely no compassion or understanding of who these people are, nor does she give any effective solutions to dealing with a narcissist, whom she refers to as a "he." As if women can't be narcissist. What an awful reader. A 6 year old could do as well. Who in the world allowed this woman to read? As for the material, it's fine as an expanded definition of narcissism. That's about it. I recommend getting another book for real information. 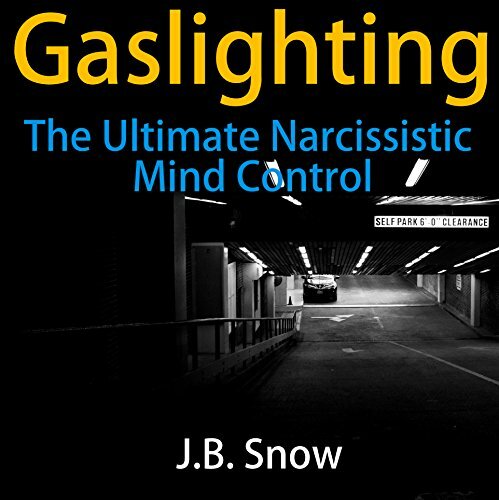 If you are the target of a Gaslighter or Narcissist, get this book!! I felt validated and hopeful after listening to this book. It's eerie how the author hits so many of the things that are neutralizing me.